Do you ever stand in front of the wadding at your local quilt shop, or at the long arm quilter's, and wonder what to buy? Have you ever asked the assistant for advice and got the answer "It depends on what you want to use it for?" Do you then chuck your hands up in horror, and grab the wadding closest to you, whatever it is; or the one sale; or the pre pack? Well, today I am going to talk wadding, or batting, whichever word you choose to use. Don't know which is technically correct, but I tend to use the word wadding. I hope at the end of this post you will be a bit wiser, and be able to make a logical decision next time you buy wadding. 1. What are you going to quilt? 2. Are you hand quilting or machine quilting? 3. How is the quilt going to be used? 4. 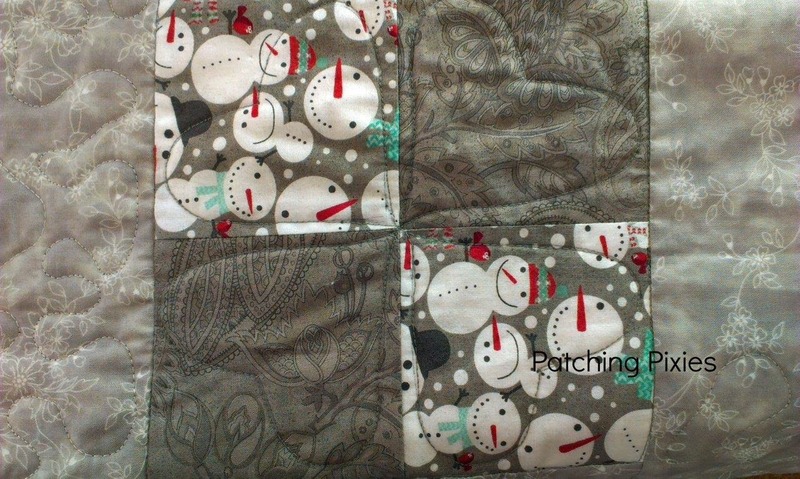 Do you want a summer or winter weight quilt? 5. What sort of a look are you wanting? The answer to each of these questions will influence your decision. And so will two other things - the composition of the wadding and the thickness of it. With regard to composition, you can buy wadding made out of cotton, wool, polyester and lately, bamboo, with various combinations of all of these. The technical term for thickness is Loft. So you have High, Medium and Low Loft wadding i.e. thick, medium & thin. What are you going to quilt? This is the easiest question. Is your item a wall hanging, or cot quilt or bed quilt? If you are making a wall hanging or miniature, you should go for a low loft wadding. It is simply a matter of scale. 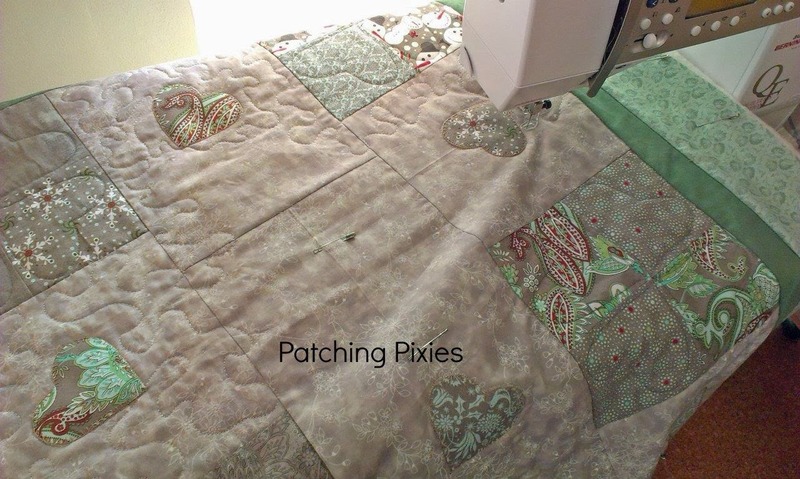 Are you hand quilting or machine quilting? Another easy question, but the choice of wadding will either make the quilting experience a happy one, or potentially a bit of a nightmare. Wadding made specifically for machine quilting will usually have a scrim, or a lightweight fabric onto which the wadding is woven, in order to facilitate the movement of the wadding through the machine. If it doesn't have a scrim, it is likely to be quite densely woven, for the same reason. 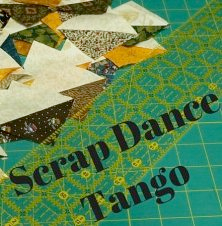 If you have some wadding scraps, try to pick it apart somewhere along an edge. If it separates easily, then you will find it more difficult to machine quilt, and it is probably more suited to hand quilting. If you are hand quilting, you need to look for a wadding which has no scrim in it, and also is a low to possibly medium loft. A soft, low loft 100% poly wadding gives you the ability to produce tiny, even stitches, and is beautiful to work with. In Australia you can buy a product called Hobbs Polydown, but it is not that easy to find. 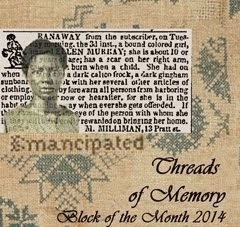 I learnt to hand quilt with Liuxin Newman, and that was her recommendation. Personally, I find cotton wadding too difficult to manage for hand quilting, as it is generally too dense to achieve nice small, even stitches. I am told that bamboo works well, but I have not tried it. How is the quilt going to be used? This is another important decision. 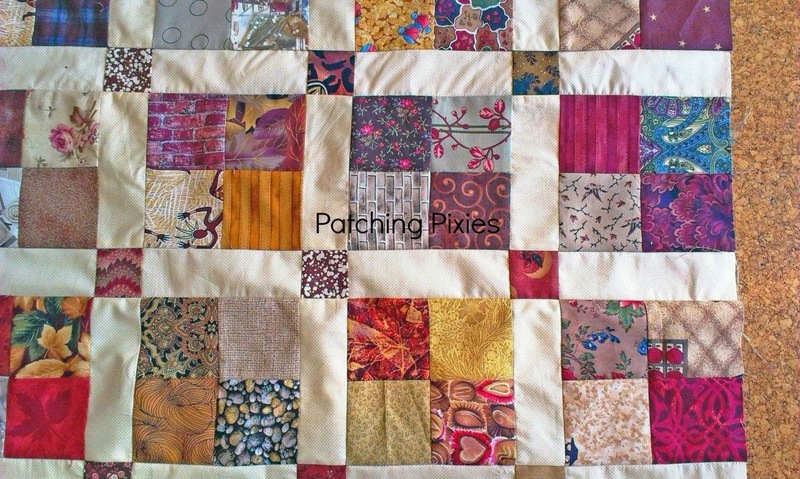 Is this quilt for a nursing home or a child, where it will be flung into a washing machine on a regular basis? Will there be dogs/cats/children/people sitting on this quilt? Is it going to hang on a wall or be used on a bed? Or is this an heirloom on which you have worked for months/years and which you want to pass on to future generations? A quilt which is washed often, usually in a machine, will need to have a serviceable, washable wadding. So you are probably going to have to use a polyester or cotton wadding, or a poly/cotton blend. You need to handle wool with far more care as it will matt and shrink if washed in a machine or in hot water. Is it a summer or winter weight quilt? 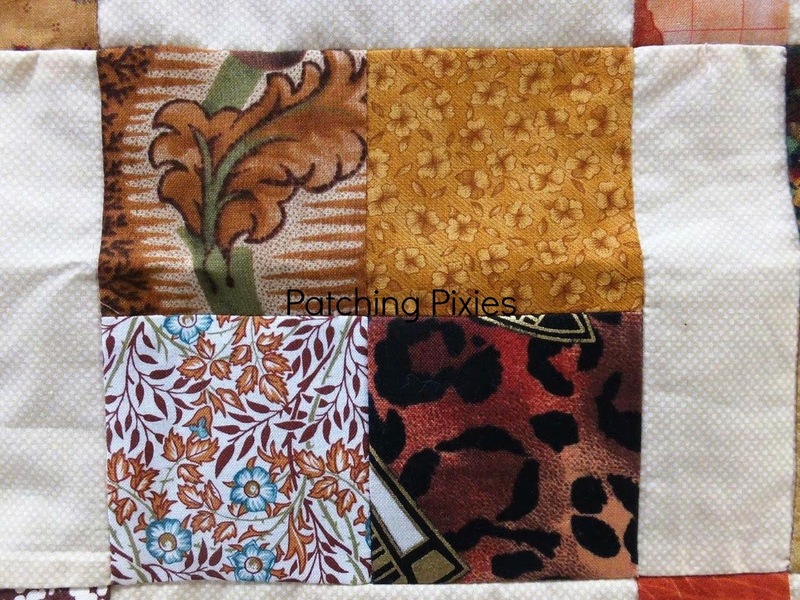 Cotton and Cotton/Poly give a thin, lightweight quilt suitable for summer, or a project which needs a light weight look such as a mini or wall quilt. Also suits a quilt which will be machine washed frequently. Wool and Wool/Poly gives a thicker, warmer quilt, with the warmth factor depending on the percentage of wool used. 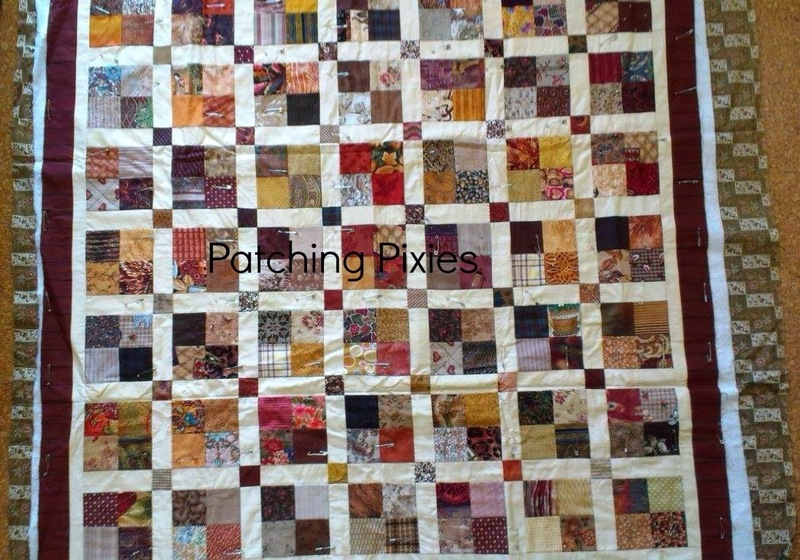 Use for quilts which will not require frequent washing or for people who will be prepared to wash it with care as wool will shrink if mishandled. 100% Polyester comes in various thicknesses - so a variety or warmth factors. Excellent washability, but be careful to choose the right one if you wish to machine quilt, as they are not generally densely woven, and can bunch up and separate when quilted by machine. Bamboo is very soft to touch and is lightweight. You can also buy wool/cotton blends which add a further dimension to your choices! Look at the percentage of each, and the notes above to work out whether the wadding you are looking at will work for your project. What sort of a look are you wanting? This is opening a can of worms!! I say this, because the look depends not only on the wadding, but the way a quilt is quilted (dense or open), the threads used and the design of the quilting as well. For this exercise I will only be considering wadding, and not all the other variables. Irrespective of the type of quilting you do, a cotton or bamboo wadding will always give you a "flatter" look, because these types of wadding are invariably low loft. If you prefer a "puffier" look, where the unquilted areas e.g. a heart are defined and sort of "plump" up, then you need to go for a higher loft wadding. So. What do I prefer? These days I have to machine quilt as my hands hurt too much when I hand quilt. I also tend to prefer medium density quilting as I like a quilt to be soft and pliable, and a densely quilted quilt feels stiff under my fingers. Besides, I have owned up before that I don't actually like quilting much, so the quicker the better. LOL. I like quilts on beds so they are mostly utility quilts, and I use them for warmth. Therefore I mostly use a 60/40 wool/poly blend - a medium loft, wadding with a scrim, which I buy by the roll. And the brand? I found Hollyburton Park about 18 months ago. They are a family owned farm in Victoria, using their own wool and other products sourced from Australia. I love the thought that they are local & family owned. And No. 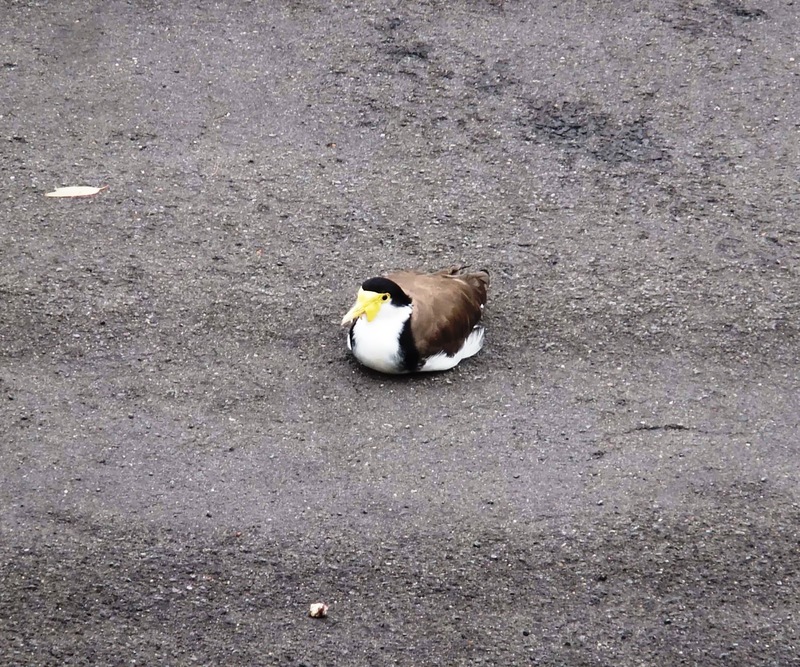 I have not been paid for this plug. I just love the feel of this wadding in my machine, and on my bed. I also use 100% cotton wadding or sometimes cotton/poly when I quilt the charity quilts for Stitching Hearts because it is serviceable and we therefore buy that in for the group. I don't like that at all. I find that it "pops" up through the fabric (there is a word for that, but I just can't think of it right now), and the result is a thin, flat quilt. The soft poly wadding, although low loft, let me make nice tiny, even stitches, and the little hearts are puffing up nicely. The resulting quilt was soft to touch and very cuddly. Thumbs up. Again, although machine quilted, the design is nicely plump. It was quite soft and will be a warm quilt. Can you see the quilted detail on this? It is actually quite flat and the quilt itself is thin. 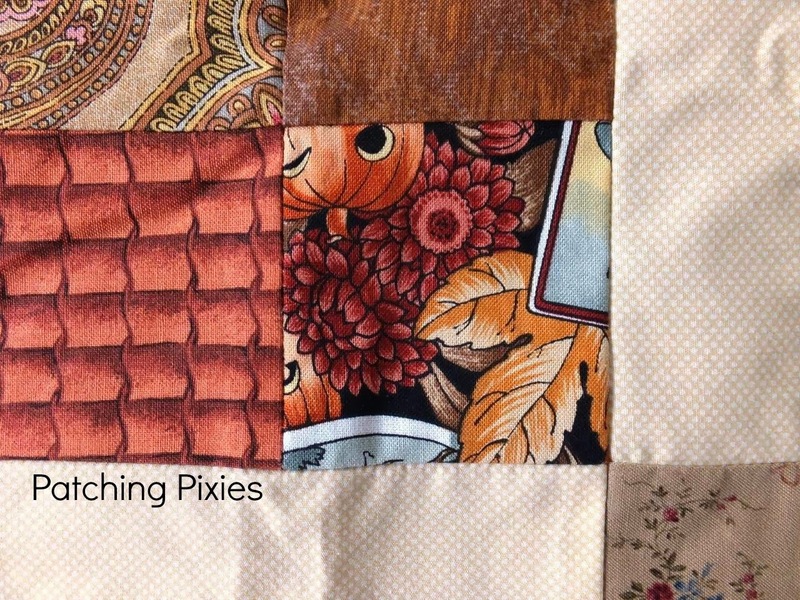 I am linking this post to Gemma's I Quilt linky party at Pretty Bobbins. You will see the button on the right of the page. This week she has asked us to talk wadding. So this fits the bill, doesn't it? Why don't you go take a look at some of the other posts linked up to that. If you have read my previous posts you will know that I have had great fun with my 3" brown squares for the Rainbow Scrap Challenge this month. The top is finished. 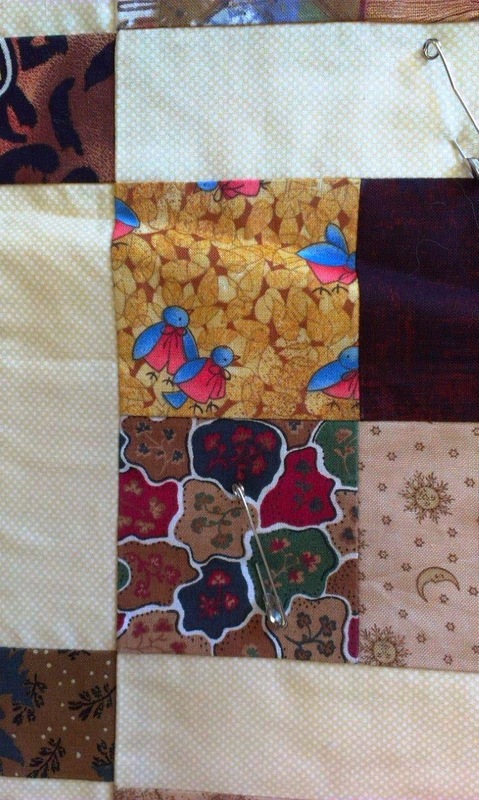 I took it down yesterday to Cabarita, and the girls pinned it for me, so it is back with me for quilting. Not quite sure when it will be done as things are now hotting up for Christmas. So glad we don't have Halloween and Thanksgiving here as well! And finally, Japanese fish print and Noah's Ark animals. That's by no means all there is, but I don't want to bore you. Aren't they fun? Our garden has been a bit boring for the last few weeks. After the first flush of Spring flowers, all we had was foliage, albeit some pretty foliage. This past week or so there have been copious quantities of rain, and it seems as if all the summer flowering shrubs have decided to flower. 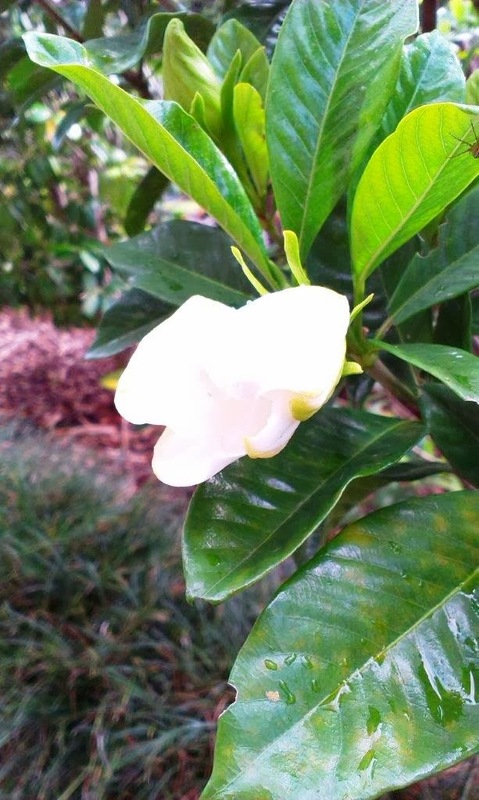 Here is the very first Gardenia. It is right outside my workroom, so when the door is open the heavenly scent wafts in. 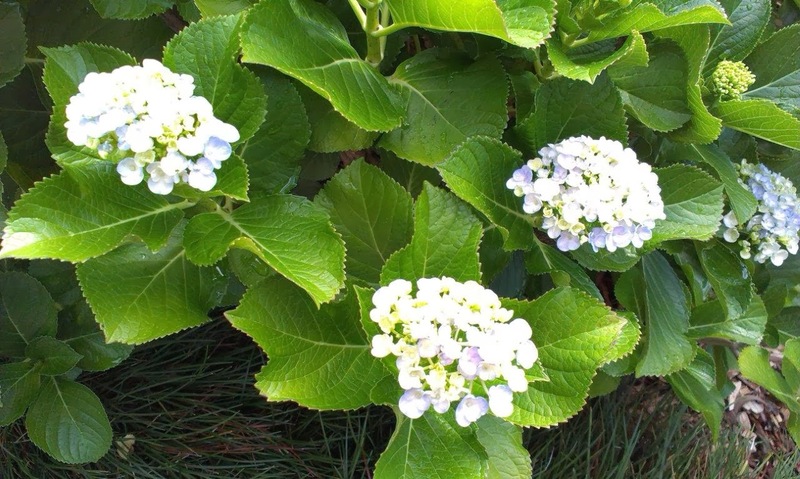 We also have a lot of Hydrangea bushes, most of them white or light blue. I spent some time through winter pruning and feeding them, and the rewards are a gazillion buds, just starting to bloom. Amongst them though are a couple of Lacecaps. Aren't they pretty? 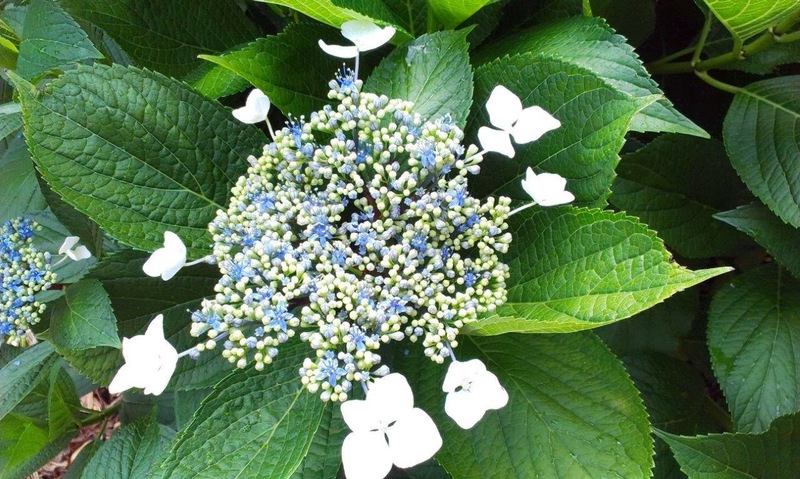 The outer ring of flowers is white, and then the inner circle is quite dark blue once it is fully open. 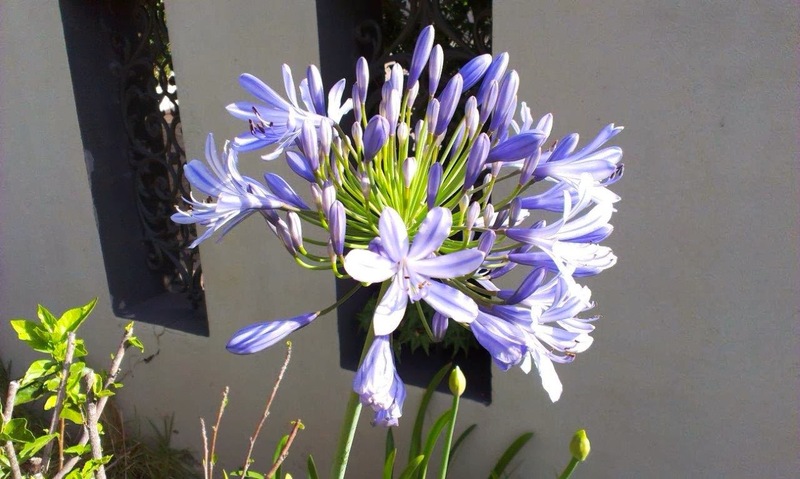 The Agapanthas are just beginning to flower as well. Ours are blue, with some white ones too. The name means "love flower" in Greek! I love them. They are such tall elegant flowers. I don't generally cut flowers, as I like them to live to their full life span in the garden for all the passers by to enjoy. I just hate the thought that they die for my own selfish pleasure in a vase. 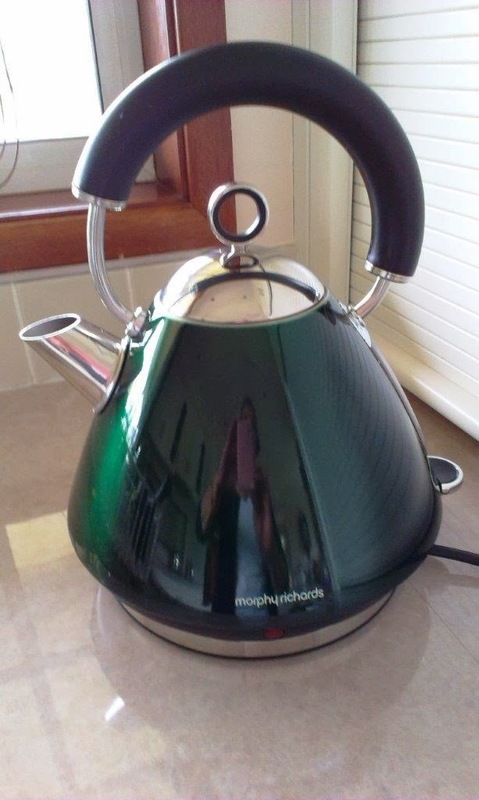 And here is my current pride and joy - a brand new kettle which arrived yesterday. So shiny, you can see my reflection as I take a photo of it! The colour of the kettle is a match for the tiles on the splashback we have had put into our new kitchen. Yesterday my beautiful daughter dropped in after school drop off. She brought a Gluten Free Christmas Cake for me. It is an absolutely scrummy, yummy, groggy bunch of goodness. I am blessed. I am planning to link this post up to the Rainbow Scrap Challenge at Soscrappy. And the Show off Saturday linky at SewCanShe. And also at Kim's Big Quilting Adventure. Why not pop over and check out some of the other blogs linked up? Not a lot of time to sew (or to blog) this week. I have had little bits of time which I have used to make some progress on several things. 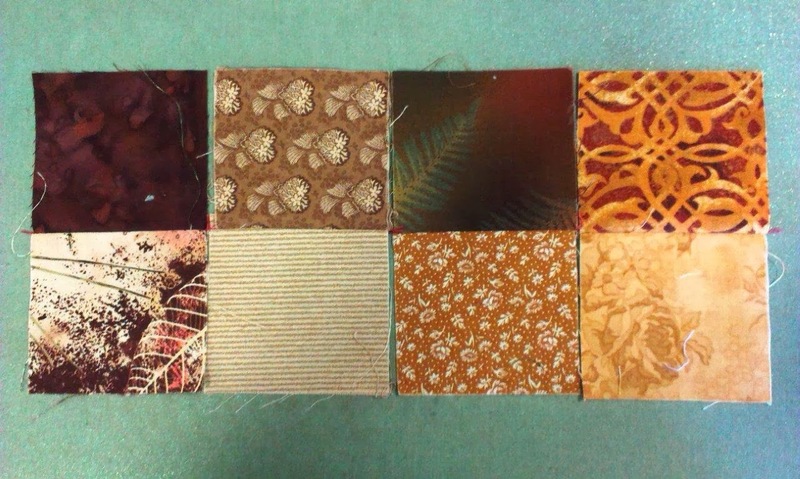 So then I got on and worked on the brown 4-patches that I have made for the Rainbow Scrap Challenge. Its only since I've launched into this that I realised that everyone else is making up one or two blocks of each colour to make into a Rainbow quilt. Well I DO have to be different, don't I? 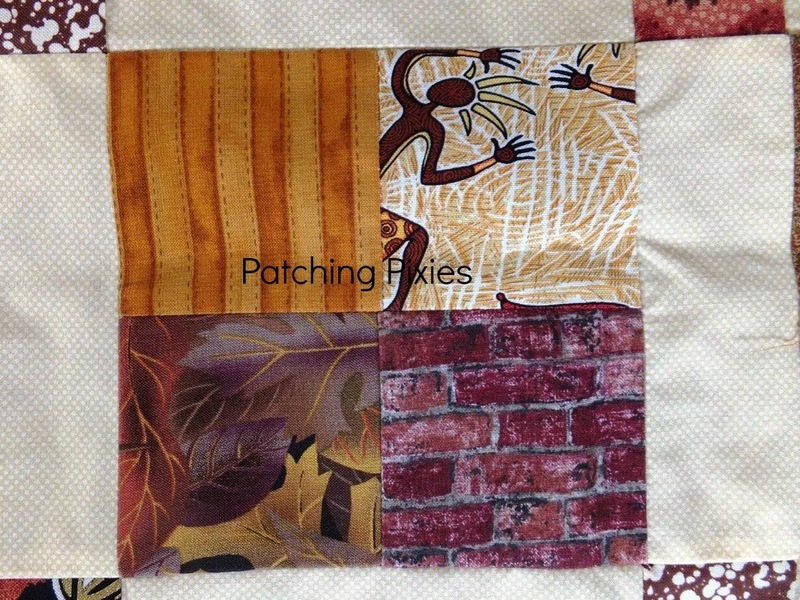 I have made up all the 4-patches, and am busily sashing them in a pale yellow, and using brown 2" squares as corner stones. As usual, the lovely soft yellow of the sashing is disappointing in this photo! When push comes to shove, there aren't too many browns in that lot are there? Lots of tan and gold, and some distinctly red and blue ones too. LOL I don't care. I have used 196 brown(ish) 3" squares, and 36 brown(ish) 2" squares out of my pre-cuts. I am happy. I have 3 rows sewn together, with a fourth row waiting to go on, so it is coming along nicely. For some reason today, as I am adding the photos to this post, Blogger is doing some weird and wonderful things with them. They are jumping all over the place, and each time I add a new photo, the Link button goes on. Very frustrating! 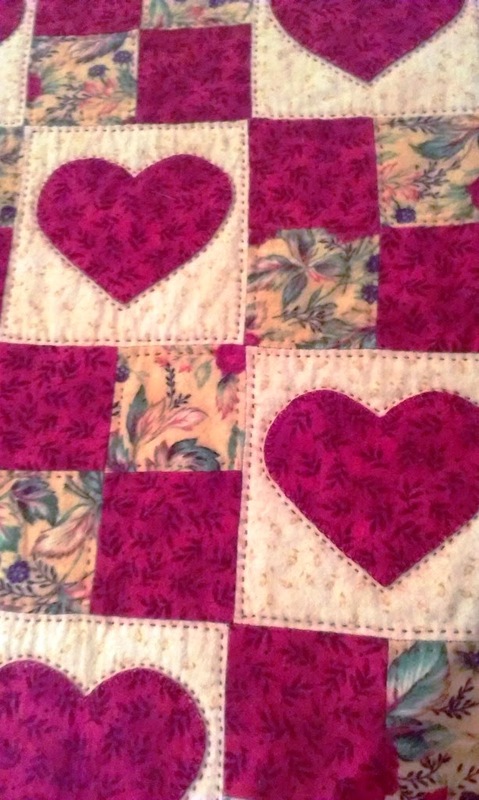 I then pulled out this gorgeous quilt made by Jill from Stitching Hearts and began to quilt it. It has been hanging around for a couple of weeks and I have been procrastinating on getting started on the quilting. It will be good to get it done. 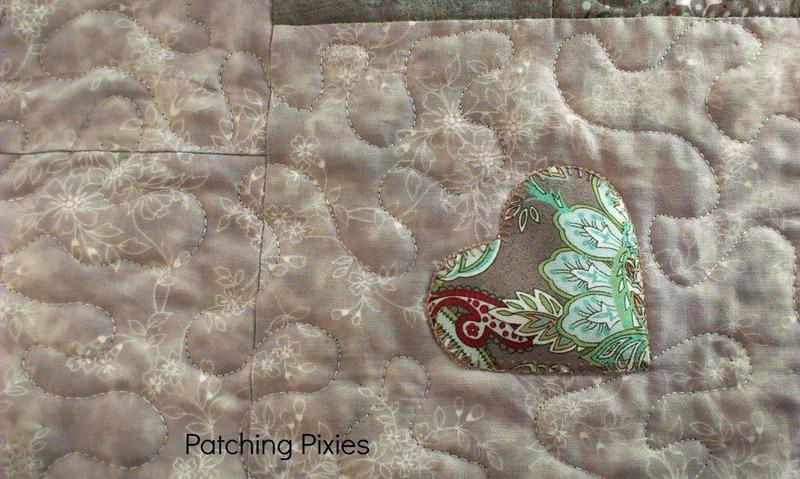 I have carried the heart theme through to the quilting, so I started with stitching in the ditch around the 4-patches and then quilted hearts into each of the 4 squares. The large areas of grey, I have meandered with a fairly open stipple, and along the way I've gone around the appliqued hearts. For this bit I've used an off white rayon embroidery thread which is quite shimmery. I quite like the rayon embroidery threads as they do give a quilt an extra bit of pizazz with the shine on the thread. There's still the borders to do, and I plan to do hearts there in embroidery thread. 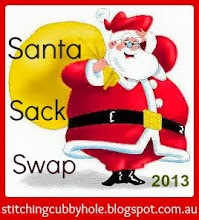 Can't show you what I have done for the Santa Sack Swap during the last week or so, but I am now working on the last gift. Woo Hoo! 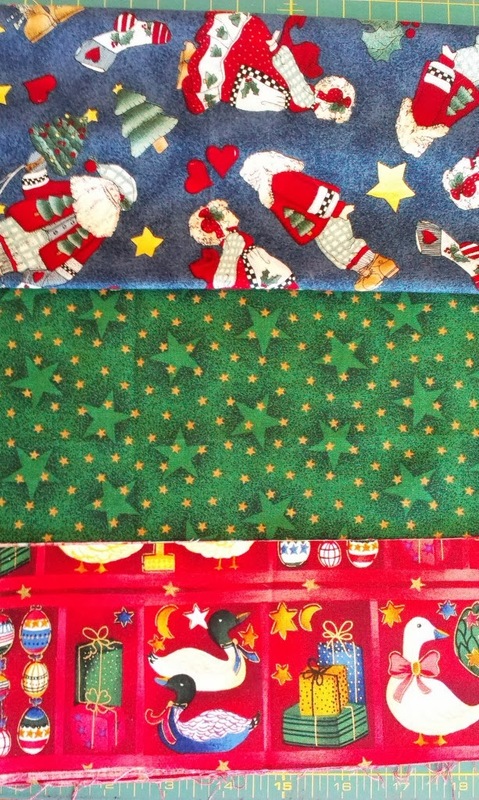 Here are the fabrics I have used for the last two gifts I have made. Don't think that will give too much away. 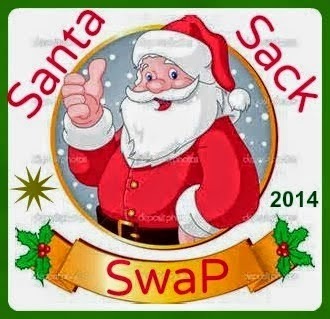 I have really had fun with the Swap. Love the secrecy, and the making of the gifts. Just a shame that I can't share the secrets! I got home from my trip to town today to discover a lovely little parcel waiting for me. A couple of weeks ago I entered a giveaway at the Cherry Pie Designs blog. The shop web page is here and the link to the blog is here. 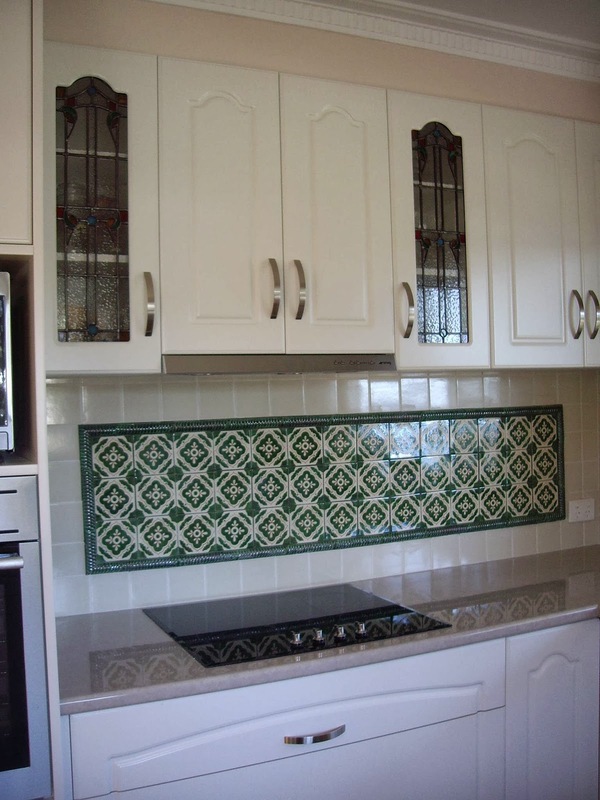 Cherry Pie Designs is run by Carol, and is located at Somersby on the NSW Central Coast - not all that far from where I live. And I won!! Woo Hoo!! 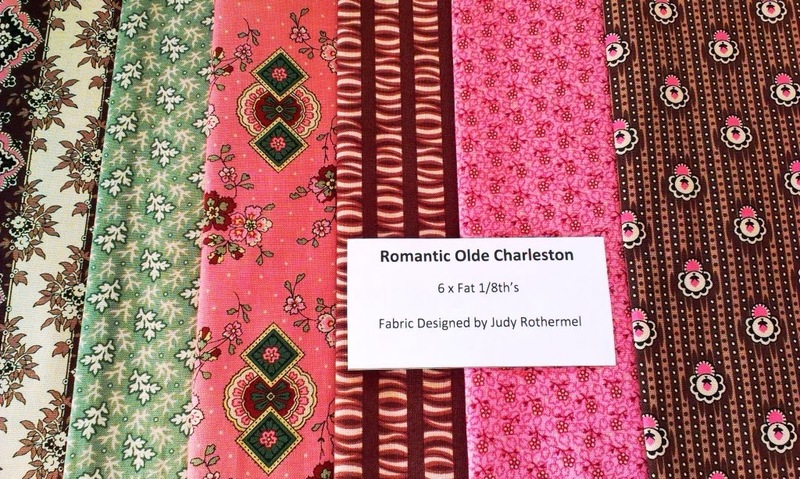 The new range from Judy Rothmel for Moda, Romantic Olde Charleston. Love it. Thanks heaps Carol. 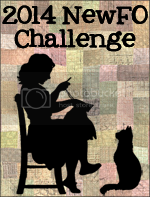 Over the months I have been reading the blogs I follow, and have come across the Rainbow Scrap Challenge, which sounded heaps of fun. 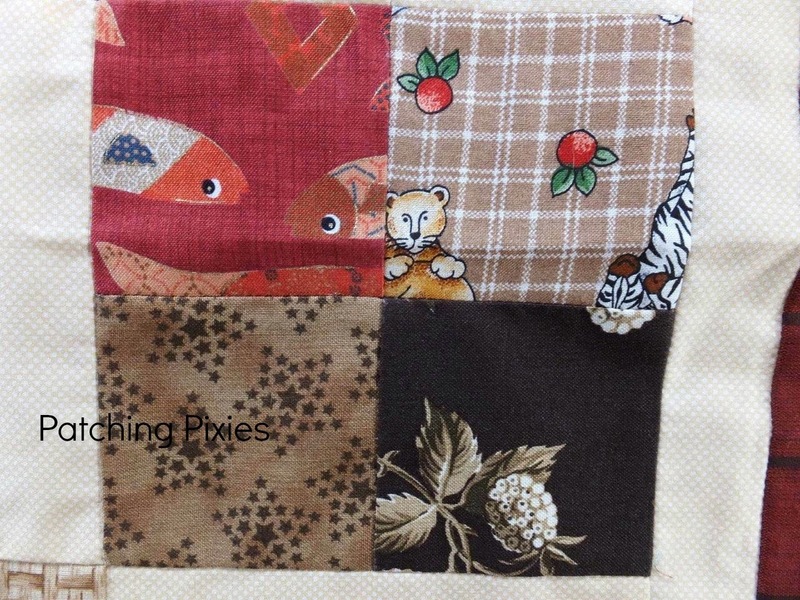 Each month they pick a colour for you to sew up using your scraps, and this month the colour is brown. So I began to sew them up into pairs, with a plan of making 4-patches and then sashing them. 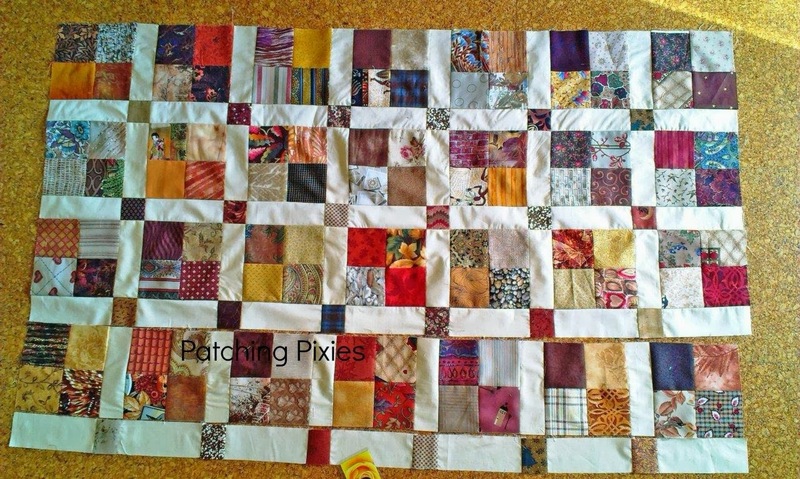 I will need 49 x 4-patches to make up a lap sized quilt for Stitching Hearts. 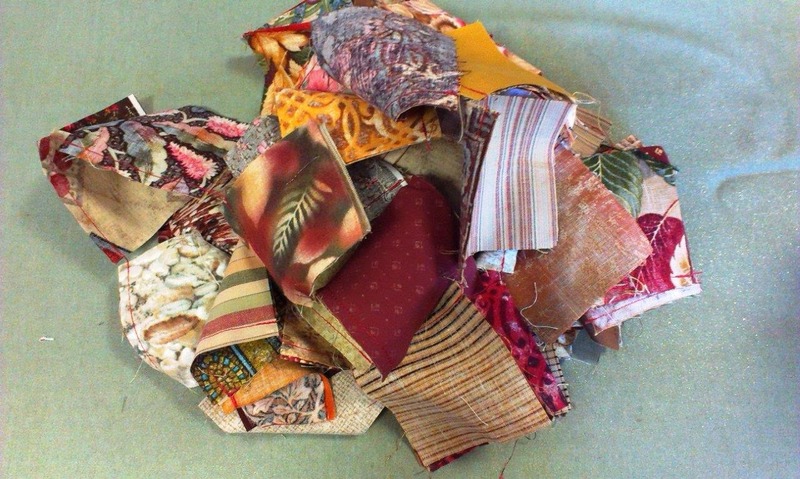 We are currently making what seems like a gazillion lap quilts for the residents of the Minnamurra Nursing Home. And here is the first batch of pairs ready to be ironed. I will count the pairs to see if I have enough before making up any more. While sewing up the first batch of pairs, I realised just how many varieties of brown there are! I also realised that something which had initially appeared brown to me, and was therefore sorted into the brown pile, was in fact a green or red, or yellow. So I have decided to have a chat about the colour brown. If you go back to primary school art classes, you might remember that brown is made up of red and green, and green is in turn, is made up of yellow and blue. So each shade of brown is therefore made up of varying degrees of the three primary colours red, blue and yellow, and may include white (to lighten it) or black (to make it darker). 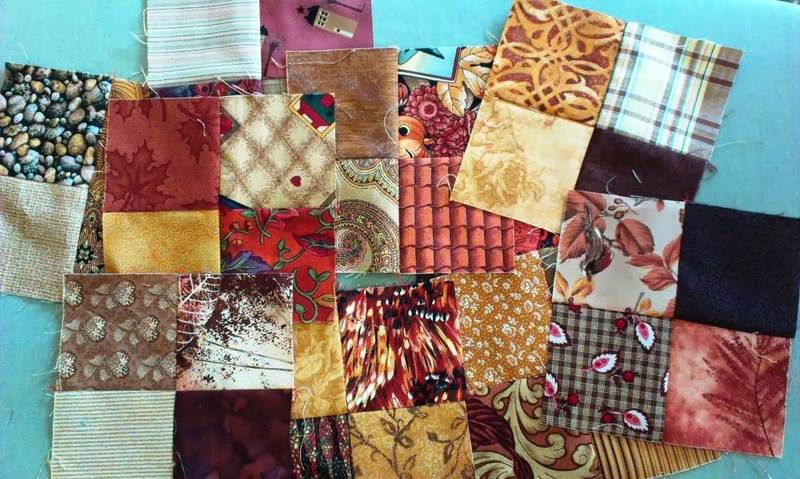 Here I have pulled some of the pairs I have sewn together. If you look carefully at these colours, you will see that going from left to right and looking at the top row, we have a dark brown with a definite red shade, which is a warm colour; then a lighter version of red based brown; then a brown with a green tinge, which is a cool colour; and lastly a brown which is almost tan i.e. there is a lot of yellow in it. Have the colours come out well enough for you to see them properly? If you try to put a red brown with a tan, it can look truly awful, but put it next to a green brown it is OK. The green brown is also happy next to a yellow brown. So the two pairs on the left are matched up with warm colour light browns and the two on the right have yellow based browns with them. That is what people are talking about when they use the term "tonal value". "Shades", on the other hand refers to how dark or light a colour is. 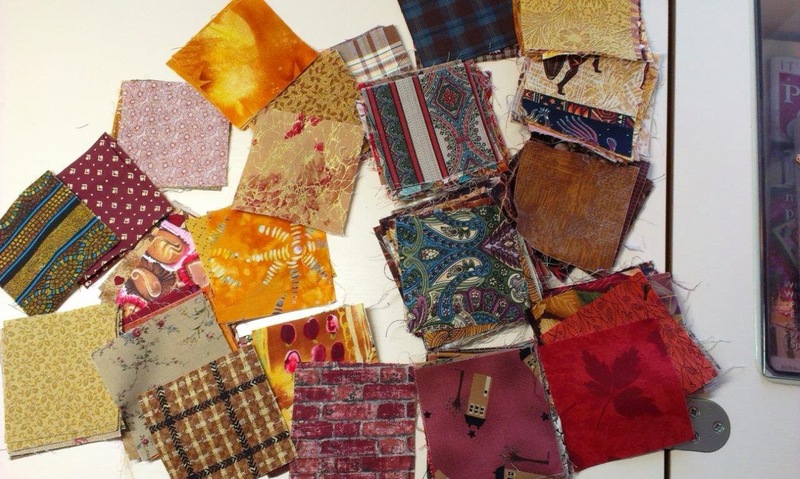 So that is how I choose my fabrics for scrappy quilts. I choose a base colour e.g. blue, green or whatever, then I use fabrics of the same tonal value. I find that way you can put scraps of truly awful fabrics together & end up with something that looks pretty good, despite the fabrics. Has all that technical stuff bored you rigid?? I hope not. Here is the first of the completed 4 patches. They don't look all that bad. I must say that I winced as I was picking up some of them to pair up. LOL. One of the drawbacks (and challenges) of working with fabrics donated to the charity group! I have decided to link up this post with the Rainbow Scrap Challenge. Why not head over there and see the inventive things that some of the others have done with the challenge.